The demand for leaders in nursing is greater now more than ever. Leaders are needed to oversee departments and practices, serve on boards, and educate and groom the next generation. From being faced with an aging population, retiring nursing managers, and a new generation with unique expectations, there is a tremendous opportunity for new nurses who want to do more. Click here to access the study. Our partner Virence has developed a practical analysis of 76 healthcare nursing and human resource leaders to examine the top issues facing employee engagement, especially among millennials. It’s been said that efficiency is the cornerstone of survival, and effectiveness is the foundation for success. This may never be more applicable than it is to the healthcare industry. Every day, healthcare facilities rely on staff members to efficiently and effectively provide the often life-dependent care patients deserve and expect. Whether it’s a local clinic with a team of ten employees or an integrated health care system with multiple locations, every health care facility relies on its staff to deliver exceptional care 24/7. Managers in the healthcare industry, however, understand that ensuring the right people are in the appropriate place at the correct time is challenging. Issues such as patient acuity, census counts, and shift requirements must be considered when creating staff schedules. 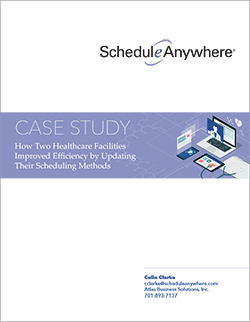 Factor in call offs, time-off requests and other last-minute changes, and it’s easy to see why staff scheduling can be a time-intensive, laborious process for nurse managers. Click here to access Case Study. Nursing Informatics Role Continues to Grow — At the intersection of healthcare technology and patient care is Nursing Informatics. It continues to evolve and adapt to the changes in technology. It has expanded to include aspects such as data recovery, ethics, decision support systems, human-computer interaction, information systems, imaging informatics, computer science, information science, security, electronic patient records, intelligent systems, e-learning and telenursing. With all of these responsibilities, patient care remains at the core. 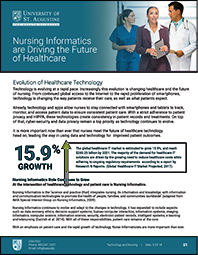 With an emphasis on patient care and the rapid growth of technology, Nurse Informaticists are more important than ever. Workforce management is a pain point for many organizations. 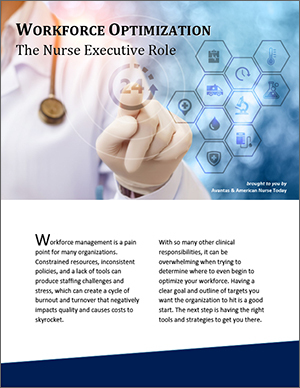 Constrained resources, inconsistent policies, and a lack of tools can produce staffing challenges and stress, which can create a cycle of burnout and turnover that negatively impacts quality and causes costs to skyrocket. With so many other clinical responsibilities, it can be overwhelming when trying to determine where to even begin to optimize your workforce. Having a clear goal and outline of targets you want the organization to hit is a good start. The next step is having the right tools and strategies to get you there. *By downloading this whitepaper you are opting in to receiving information from Healthcom Media and Affiliates. The details, including your email address/mobile number, may be used to keep you informed about future products and services.